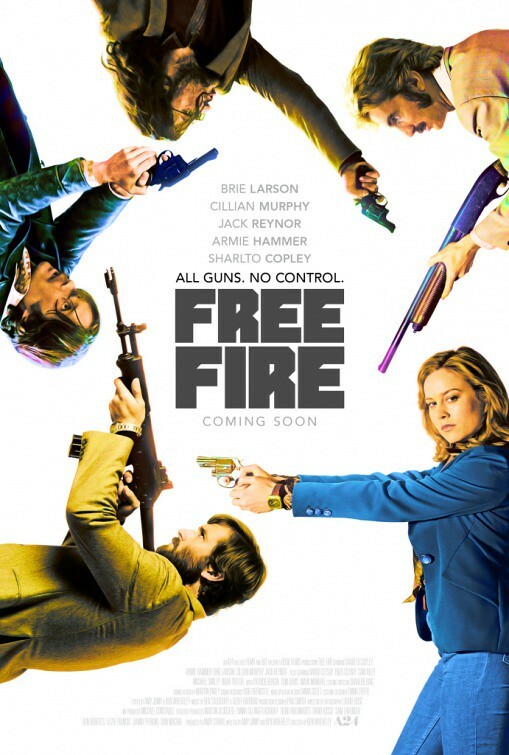 If you’re a fan of Quentin Tarantino’s earlier work, Free Fire may be just the thing for you. It stars a colorful cast of characters with some witty dialog and one long drawn out gunfight in an old warehouse. With a movie that literally doesn’t go anywhere, it still manages to be entertaining with some off the wall characters. The premise of the movie is a group of Irishmen are buying guns from a gun dealer named Vernon. Each side brings some helpers and they hire some intermediaries to smooth out the deal. However there is one person on each side who makes the whole deal go terribly wrong as it escalates into violence and past the point of no return. To bring this story to life is an interesting cast. On one side is Cillian Murphy, who really is Irish. There’s Sharlto Copley playing Vernon the gun dealer, Armie Hammer who plays Vernon’s back up and who acts as one of the intermediaries in the deal, and Brie Larson who plays the other intermediary. Sam Riley and Jack Reynor are the two surprising standouts as they’re not actors you’d really recognize from anything else, yet they’ve got key roles in this film and rather large parts. They play Stevo and Harry respectively, and they’re the cause of all the trouble as they got into a fight the night before and when they run into each other at the gun deal, the fight picks back up and leads to all out chaos. The interesting thing about the film is the small scale nature of the story. There’s no long leadup exploring the backstories of these characters, nor is there any followup adventures showing what happens to these people. The whole film takes place inside a large abandoned warehouse where they do their gun deal. It starts with a lot of dialog bits that allow you to get to know some of the characters. Then the conflict jumps in, guns get drawn, and people start to get shot. Yet there are breaks in the gunfight as people trade quips and argue amongst each other as they try to regain control of the situation. But the gunfight never ends as people keep getting shot. By the end of the movie, everyone is in terrible shape. Many of them die. And the ending is very similar to Reservoir Dogs, which is a good comparison to the vibe of this movie. If you watch the trailer, you’ll get a good sense of what this movie is like. However, it does fall a little short of some of the other great gun flicks with colorful characters and fun dialog. With everything taking place in the one confined environment, it creates a very small scope for the movie. Some of the characters like Chris played by Cillian Murphy never really get fully fleshed out. You get a taste of each character, you get some gunfights and some funny dialog, and that’s about it. It’s entertaining and it’s close to be something really great and fun, but I think the ending may have robbed it of what it could have been. As is, it’s still worth a watch and I give it a four out of five metal bikinis. That said, you don’t have to see this one on the big screen as it would play out just as well at home. It’s one-joke, but it worked for me. Nice review.